Sticking to a workout routine is a challenge, even for the most disciplined of people. The thought of spending at least an hour to get the full workout the body needs to stay fit and healthy isn’t very fun for most people. Having a gym at home makes working out easier and more accessible, but at the same time, it can also lead a person to have excuses to skip their routines. This is no surprise when you have to do cardio first and follow it up with a muscle toning routine. It is tiring to have a routine that requires you to jump from one activity to another. One exercise machine that eliminates the need to do cardio and muscle toning separately and is also great for a home gym is the rowing machine. Machines like the Marcy Turbine NS-6050RE Magnetic Rowing Machine offer people who have fitness goals to meet or people who want to maintain their active lifestyle a chance to shorten their workout routines without sacrificing their progress. This review will give you an insight on what to expect when you purchase this particular type of rowing machine. A really big advantage of the Marcy Turbine NS-6050RE Magnetic Rowing Machine is the high weight capacity of the rowing machine. Unlike other machines, this can hold up to 300 pounds without any issues of bucking. This signifies that the machine is very stable, sturdy, and reliable. The value of the rowing machine is also heightened due to the smooth rowing motions it allows users. It does not strain the body, but it does increase the heart rate while also working all the muscles to give the desired effect. The 8 different levels of resistance that the machine is also capable of is a big advantage for people who are training their bodies to build up strength and stamina. People can easily adjust the resistance level to meet their personal needs without any effort. The machine is also very easy to set up – you will be ready to use and row in less than an hour after you start assembling the rowing machine. The rhythmic rowing the machine provides is also a big advantage for bigger and older people who want to avoid severe impact during workouts. It is also advantageous that the machine is foldable and comes with a set of wheels. This allows users to easily transport the rowing machine from one spot to another, and this feature makes storage very convenient. The machine will not crowd or clutter your home because you can keep it locked and stored and only bring it out during your workout sessions. The footholds of the machine are adjustable, which makes them safe and comfortable to use. Combined with the non-slip handles, users can row with ease and security. Finally, the padded seats are a big plus because it fully and comfortably supports the back to allow for smooth rowing. One main disadvantage of this particular rowing machine is the lack of resistance. For people who are strong enough the maximum 8th level does not provide the resistance they require to have a full-body workout. This can be an issue for those who feel like the highest setting is no longer beneficial to them. You can counter this problem by adding more time and increasing the speed of your rows to ensure that your stamina keeps building up, even when the resistance is no longer a challenge. 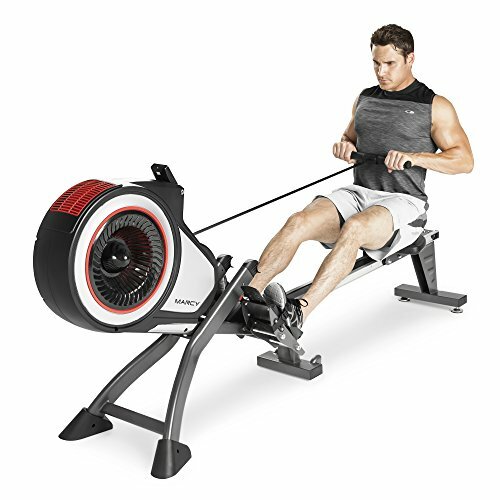 Also, keep in mind that the computer display that comes with this rowing machine requires the use of 3 AAA batteries and they are not included in the package. Go and purchase some early on so that you can use the display right away and monitor your progress on the first day of use. Finally, the machine can be a bit too loud, making it hard to watch TV or listen to music. Use earphones instead when you are on the machine. The Marcy Turbine NS-6050RE Magnetic Rowing Machine is a rowing machine that is built to last you years. It is easy to set up, use, and maintain. You will have a reliable exercise machine to keep you fit and healthy for years to come, definitely worth your money.